District Properties will be meeting with the Wellburn’s owner soon to share their vision for the site. I secretly hope Wellburns suffers a quick and painful demise for there part in trying to impede the Bluesky building. Was Vic Lum himself involved in the opposition? From my understanding and sources, yes. Him and the lady that owns the coffee shop on Mason, plus the farm were the head henchmen. A petition to stop the Bluesky proposal was available at Wellburn's for customers to sign. Here is District’s submission to NPNA. 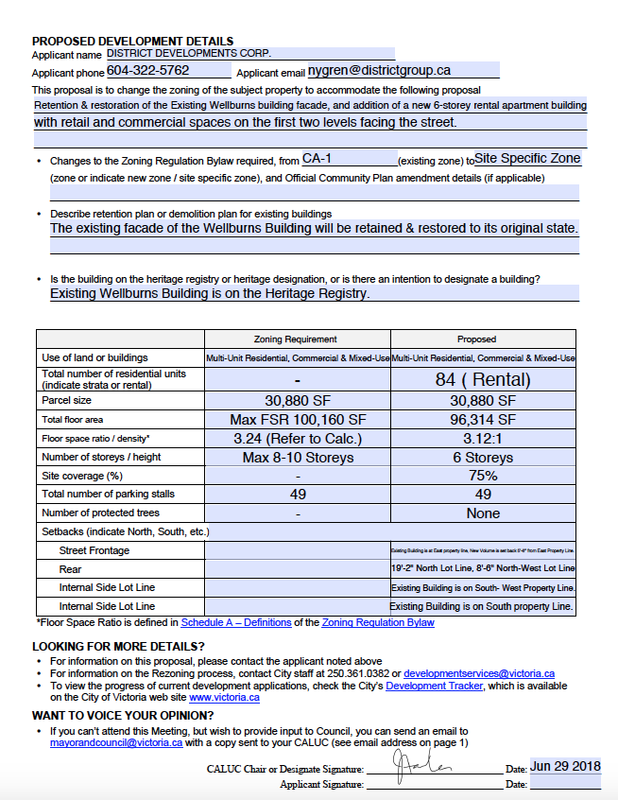 http://npna.ca/wp-co...-mtg-notice.png The plan is to restore the Wellburn’s building and construct a 6-storey rental apartment on the parking lot. The new building will be “stepped back” on higher storeys and will feature more commercial space on the first two floors. The community meeting will take place August 1. Hopefully we will see renderings soon! Edited by Kapten Kapsell, 20 July 2018 - 10:19 AM. So it will more-or-less be a bookend to the Bluesky project at the other end of the 1000 block of Pandora - with some heritage preservation for good measure. I look forward to the furore by the local anti-gentrification crowd as they fight to preserve a pothole-filled parking lot. Thank you for the heads-up, Kapten! It looks like District will build 84 rental units as part of the proposal along with restoration of the Caption Building's facade, but not heritage restoration of the actual building. That's a common practice nowadays and can result in a far more practical structure for future residents and commercial tenants. It appears it will be the podium. The building will be razed and the facade restored. Well now that the heritage portion will be gutted and just the facade saved.... nail meet coffin. Ok, I am completely confused by this. Does District own this site or does Wellburn's? No one needs permission from the previous building owner. I certainly don't need permission with my commercial tenants as to what I do with my building. Can someone also give me a little history of the NPNA. Are they elected by official ballot during a municipal election? Is there a City bylaw recognizing them with any authority? Or are they they a group of citizens who meet for coffee at the McDonalds? ...Can someone also give me a little history of the NPNA. Are they elected by official ballot during a municipal election? Is there a City bylaw recognizing them with any authority? Or are they they a group of citizens who meet for coffee at the McDonalds? I am not sure exactly how they came to be, (certainly not by any sort of general ballot) but they are well versed in NIMBY-ism and shouting down those whose opinions do not jive with their own. Their members were exceptionally vocal in opposition to the St. Andrew's/Bluesky proposal. It’s a neighbourhood association like all other neighbourhood associations. District owns the site / property. There are a number of possible good reasons for the new landlord (District) to meet with their primary tenant: discussion of development timelines, options for including Wellburn’s in the property long term, gathering the tenant’s support before meeting with the neighbourhood etc. Edited by Kapten Kapsell, 20 July 2018 - 03:49 PM. The architect is MG Architecture of Vancouver, the same firm that District is partnering with for the Scott building project at Douglas and Hillside. Right! so a bunch of nobodies basically and from what NParker said not eveng elected by the residents of the neighbourhood. I say they should be ignored. It would be the same as a everyone here starting the VV Neighbourhood Association. 6 storey for this site REJECTED, can I get a seconder?